Backcountry is based on a true story and is written and directed by Adam MacDonald. 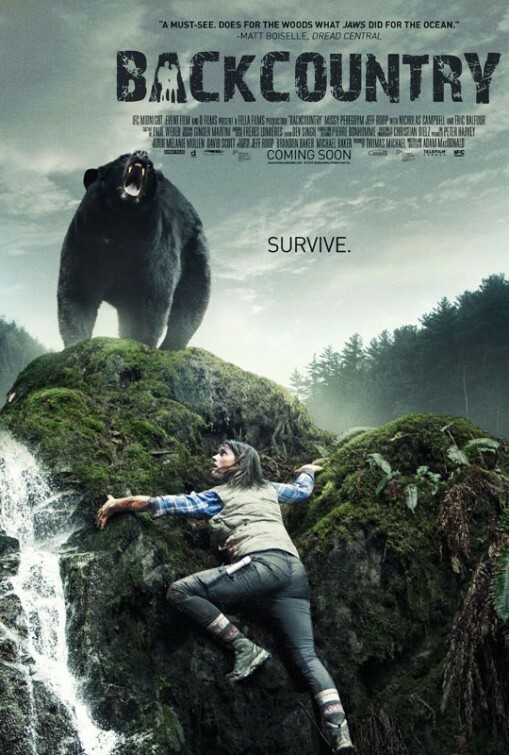 It tells the story of two campers, Alex (Jeff Roop) and Jenn (Missy Peregrym), and how their relaxing getaway in the woods turns into full on life altering horror when they realize they have gotten lost and are being terrorized by bears. Now it's man vs. nature in harrowing game of survival. The characters of Alex and Jenn are really the only two people in the movie, save for an unexpected guest early on played by Eric Balfour, so it's very important that we like these people and care about them. If we don't then the movie suffers tremendously because the tension will not be there as we root for them to survive. Luckily the two leads, Roop and Peregrym, portray very likeable people and a very relate-able relationship. They're good looking, but not in a distracting way. They're smart, but not unbelievably so. They goof around, they bicker, fight, apologize, and seemingly enjoy each others company. In other words, they are real people. They could be our friends, our neighbors, or even us. So I liked these people and was invested in them from the beginning. The writing supports the performances by allowing the viewer enough natural feeling exposition to understand their back story and the state and strength of their relationship. Kudos to all involved for making the characters really come through like that, especially Peregrym whose fear comes through in her eyes, her voice, and her whole body with off kilter movements as she is forced to adapt to the situation. The music and sound work to really enhance what the film wants to say. The score has a backwoods twangy sound mixed with adrenaline filled beats to support the locale and action in the film. To accompany the calmer moments in the film there are soft, almost dreamlike tones that invoke the tranquility of nature, as well as the love between the two leads. Of course, this is a story about people lost in the woods being hunted by bears so the score also provides loud, sudden doom-like shots that drag out like a bad feeling. The sound picks up every leaf crunch, every singing insect, and all animal footfalls perfectly and makes the viewer feel alone in the woods with these people. And finally the scenes with the bears are downright terrifying. The strength and rage of the bear is shown in a ferocious attack that is full of spit-filled snarls and throaty roars. The bears seem to know their territory so well and display a relentless pursuit that cloaks the woods in a sense of futile doom while the characters scramble to survive. One brilliantly filmed scene has Alex and Jenn sleeping as a bear approaches their tent. The filmmakers were very smart to keep the camera inside the tent and only show the silhouette of the giant bear on the outside as it curiously wanders the perimeter of the tent, pressing it's face against the thin walls and opening it's mouth as it breathes, creating a mold of itself on the flimsy shelter. All of this happens as we see Alex and Jenn in frame sleeping, blissfully unaware of the danger that lurks mere inches from them. It's a fantastic sequence that reminded me of Freddy Krueger pushing through wall above a sleeping Nancy in A Nightmare on Elm Street. Backcountry is an example of what can happen when man is out of his element and just how quickly life can turn into a living nightmare. It's a solid thriller that kept the tension high as I watched it. I would just suggest that you watch this AFTER your camping trip.